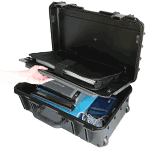 Laptop Compartment: Universal laptop case holds most 13 to 17 inch laptops. 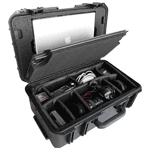 Lower Compartment: Modular padded divider interior holds sensitive electronic gear. 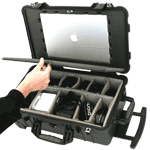 Laptop Compartment: Accommodates most Apple or Windows-based laptops up to 17". 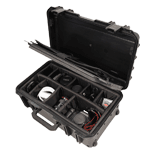 Lower Compartment: Modular padded divider interior holds most photography gear. Laptop Compartment: Holds a 15" or 17" Apple Mac Book Laptop. 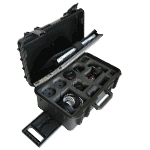 Lower Compartment: Holds popular Canon or Nikon SLR cameras. Lower Compartment: Room for storage of sensitive equipment. 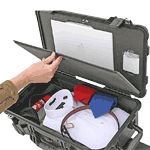 Laptop Compartment: Holds most 13" to 17" laptops. 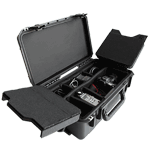 Lower Compartment: Storage space for everyday needs. Lower Compartment: Allows for storage of everyday needs.